From domestic DIY environments, right through to heavy industries and military applications, protective eyewear is one of today’s most common types of Personal Protective Equipment (PPE) and an important part of self-protection in the workplace. 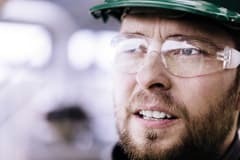 Ahead of World Sight Day on 13 October, Global Head of Personal Safety, Robert Wells from BSI looks at the different types of eye protectors available and offers advice on choosing the best solution for the job at hand to avoid eye injuries. With the ever-rising need to comply with strict health and safety regulations, more and more organisations are forced to take a fresh look at issues surrounding the use of PPE. In order for individuals in certain industries to stay safe and avoid unnecessary injuries to the face or eyes, they need to wear the right eye protectors. There are currently many different types of protective eyewear on the market – each with its own use and specific application – including swimming or squash goggles, sunglasses, safety spectacles, welding shields and special mesh face screens designed for forestry. To keep employees safe in the workplace and reduce health risks, it is up to employers to invest in the right protective equipment. Eye protection has to comply with all the requirements of the PPE Directive and carry the CE marking to be sold legally in the EU. Exceptions to this rule are eye protectors specifically designed and manufactured for the armed forces and police officers, as well as helmets and visors for users of two- or three-wheeled motor vehicles, although even here there will be specific requirements covering those products. Minimal risks are present and employees can identify and assess the level of protection that the product offers. This covers PPE designed to protect against sunlight and includes sunglasses and swimming goggles. In order to fall into this category, eye protectors must comply with the Essential Health and Safety requirements and bear the CE marking. Neither complex nor simple, protective eyewear in this category includes welding shields and safety spectacles. These products should be certified by a Notified Body, to prove that they meet the technical requirements of the PPE Directive’s relevant specifications. PPE in this category is designed to protect workers against dangers that could cause serious harm to their health and in some instances, death. These products safeguard employees against electrical risks, dangerous voltages and provide insulation during high-tension work. To meet the requirements of this category, manufacturers not only need to get their products certified by an accredited body, but also undergo constant surveillance. Their chosen accredited body will select and test samples to ensure all products meet the required standards. Products that fall into this category include filters and eye-protectors against laser radiation. Is your PPE up to standard? With tightening health and safety regulations in the workplace, managers can no longer simply buy any protective equipment. Each purchase needs to reflect their knowledge of what exactly is needed to provide the right protection for their employees. To ensure eye protectors are fully compliant, currently products have to be certified to the Essential Health Requirements of the PPE Directive 89/686/EEC, this can be done through testing the product to a published harmonised standard or to a manufacturer’s own technical specification. Harmonised Standards are listed in a document called the Official Journal which is held on the European Commission website and is a ‘live document’ therefore updated on a regular basis. When it comes to distributing PPE in the European Union (EU), all products that fall under the European Directive must carry the CE mark. This is a legal requirement and means that manufacturers are allowed to do business in all 28 EU member states. For example, once a CE approval has been issued in the UK the product can be sold across Europe – from Portugal right through to Greece. If a product bears the CE marking, it has been assessed against the essential safety performance criteria as specified in the EU Directive. This mark also acts as the manufacturer’s confirmation that the product adheres to the specific requirements of all the Directives that apply to it and that it can be sold legally in the EU. BSI holds and runs a voluntary quality scheme called the Kitemark. Many manufacturers apply for this certification to make sure their products stand out from others. In order to achieve the Kitemark certification, a product must comply with the specified requirements of a publically available standard, such as a British, European or International Standard, or PAS (Publically Available Specification). For example, BSI runs a scheme for eye protectors to EN 166:2001. If a product holds the Kitemark licence, it has been through a rigorous testing process to ensure it meets the relevant standards and passes all the applicable requirements. This also involves the assessment of the factory’s quality management system against the ISO 9001 requirements. Once a licence has been issued, the manufacturer’s factory will be audited on a regular basis and products will be tested frequently to make sure they still comply with the specified requirements. Both the audit testing and factory assessments are above the minimum requirements specified for the Intermediate and Complex category in the PPE Directive. Manufacturers that achieve the Kitemark certification demonstrate their on-going commitment to deliver eye protectors of the highest standards to the market. levels of protection against an identified health and safety hazard. Since these standards are hazard based, they incorporate a number of mechanical test requirements which have been developed around the specific fields of protective eyewear use. Invariably, protective eyewear standards include impact testing (EN166:2002). EN166 is just one of numerous eyewear standards that includes an impact test. During this particular evaluation, eye protectors are tested for robustness and their ability to protect employees against high speed particles. The products’ robustness is put to the test by dropping a 22m steel ball from a height of 1.3m onto the lenses and for lateral protection. To see if an eye protector would safeguard its user against high speed particles, 6mm-sized ball bearings are projected onto the eyewear at one of three impact velocities, including 45m/s, 120m/s or 190m/s – depending on the level of protection claimed. This test can also be done in extreme temperatures (+55°C and -5°C) to represent authentic working conditions. If the eyewear shows any fractures, signs of penetration, deformation to the eye or separation of the lens from the frame after testing, it has failed to meet the required standards – and would not be safe enough to use in the workplace. In cases where workers are exposed to splashes of molten metal, another optional test in EN166:2002 should be carried out to measure the eye protector’s ability to withstand such a hazard. In this particular test, 100g of molten grey iron (1450°C) and Aluminium (750°C) is projected onto the eye region. To see if eyewear can withstand the penetration of hot solids, a 6mm ball bearing, heated to 900°C, is applied to the surface to determine the time it takes to pass through the material. As part of the mechanical testing process, eyewear is also tested for their resistance to ignition and the strength of spectacle frames. To see if products can withstand ignition in EN166:2002, a 6mm diameter x 300mm long steel rod (pre-heated to 650°C) is applied to the relevant parts of the eyewear. If the eye protector doesn’t ignite or glow after removing the rod, it passes the test with flying colours. To assess the strength of spectacle frames, the side arms and frame are flexed for 500 cycles at a rate of 40 cycles per minute. To pass, the product should show no fractures or permanent damage after this stringent testing procedure. Some users need prescription lenses in their safety spectacles to conduct their daily work tasks. In these cases, custom lenses are made to suit the individual user’s vision. This means that each pair of spectacles may have exclusive physical and optical properties, and that assessments are based on a number of spectacles – ranging from the lowest to the highest power in each lens material as well as frame models. To test power and power tolerance in EN166:2002, an automatic focimeter is used to measure the spectacles’ optical power properties. This is followed by determining the centre and edge thickness of the lens, before testing for the eyewear’s ability to withstand increased robustness and high speed particles as mentioned above. If a specific prescription meets these impact tests, it can be reproduced in future as long as the thickness of the sample does not decrease below the values stipulated in the test programme. There are currently three classes of optical power with different degrees of tolerances, depending on the intended use. Class 1 refers to long-term use, while class 3 is for short-term use only. To see if eye protectors offer a clear view to wearers while working, the surface quality of lenses and diffusion of light is tested by a trained assessor. By looking at a high contrast pattern through the lenses, any defects such as scratches, surface waves and watermarks are immediately highlighted. To determine the diffusion of light that often comes across as a haze, a helium-neon L.A.S.E.R beam is passed through each lens. By measuring the ratio of light which passes directly through the lens in a straight line, versus light that veers away from a straight line through a specified range of angles, the degree of light scatter is accurately determined. Standard tolerances are used to determine the compliance of products in this area. Protective eyewear with clear oculars must transmit more than or equal to 74.4% of light as defined in EN166:2002. To measure the actual percentage of light transmittance, a tungsten filament lamp and photocell and meter are used. The lens is placed between the lamp and the cell in a light tight enclosure, and the amount of light that passes through is measured. This is then compared to the light reaching the cell without the ocular in position, before calculating the percentage of transmittance. If the lens is designed to filter light, and therefore protect the wearer while welding or from ultraviolet, infrared or sun glare radiation, a spectrophotometer will be used to test its filtering properties. The results will then be compared to the relevant standard’s stipulated limits. Choosing the correct eye protection for the workplace is crucial to preventing eye injuries. According to Prevent Blindness, more than 2,000 people injure their eyes at work each day. The correct use of PPE equipment can ensure employees that are exposed to flying particles, molten metal or other hazardous substances are protected.